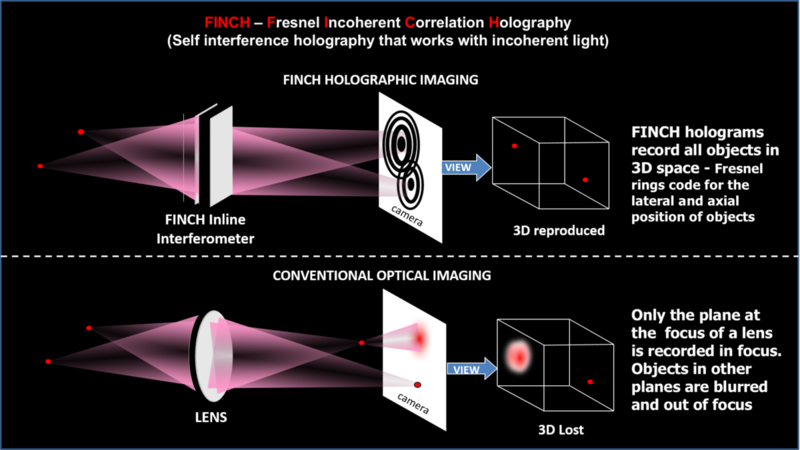 CellOptic’s FINCH (Fresnel INcoherent Correlation Holography) is an imaging platform technology that generates 3D holograms of every point in an object or scene, and then processes those holograms computationally to create focused images of the object or scene. The FINCH images are super high resolution and enable users to go beyond the conventional high magnification microscopy optical diffraction limit of 200 nm resolution. The patented CellOptic solid state Birefringent FINCH optics create multiple holographic images that are then converted into single plane super resolution images from widefield or confocal image planes in a new microscope called CINCHSCOPE for Confocal INCoherent Holography. Verification of super resolution by imaging 110 nm beads at 590 nm emission wavelength. 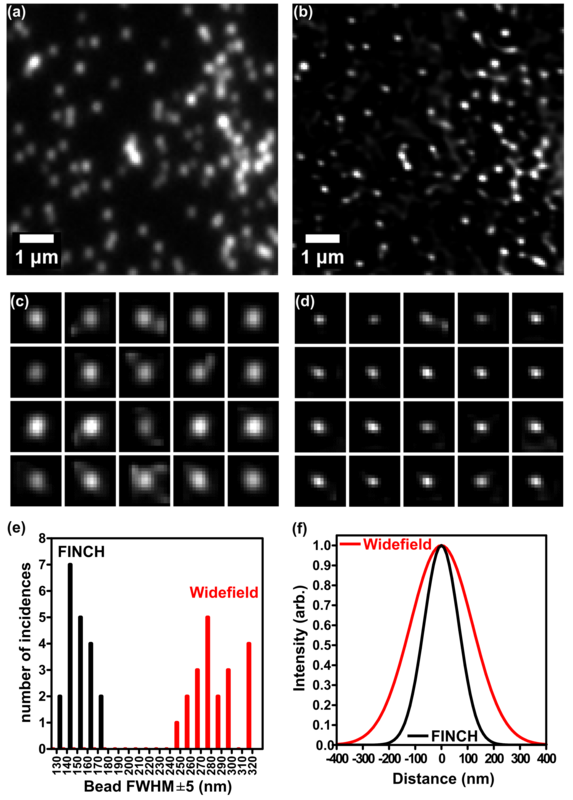 Resolution comparison of widefield and FINCH imaging of fluorescent beads. (a,b) 8×8 micron zoomed selections of 110 nm fluorescent beads for resolution comparison of the same area between (a) widefield fluorescence and (b) FINCH images. (c) and (d) are 1 micron square zoomed images of the same randomly selected beads from (a) and (b) respectively. The beads in the respective parts of (c) and (d) are the same. (e) A histogram of FWHM size distributions amongst the 20 beads that were measured in (c, d), showing the approximately two-fold reduction in FWHM by FINCH. (f) Plots depicting the average FWHM sizes of the 110 nm beads as measured by widefield and FINCH fluorescence microscopy, with normalized Gaussian functions of the average width measured from the 20 selected beads. From Nature Photonics 10, 802–808 (2016). Copyright © 2019 CellOptic, Inc.